There’s always a little bit of stress involved when about to address a crowd or, in this case, send a campaign to thousands of subscribers. After all, you are proud of the work you’re doing to make the campaign come together, and you’re excited about the possibilities. But once you hit “send,” the campaign is out of your hands. Enter send fear. Most marketers feel anxiety when hitting the send button. Is everything in the email on par? Will the images render like I want them to? Do all the links work? It’s enough to make the most experienced marketers break a sweat or two. Email send fear can be paralyzing. To the point where one could decide not to send the campaign. But business is about taking chances, and it’s time to vanquish email send fear once and for all. Today, we’re sharing tips so you can feel confident each time you click send. – An unnamed marketing genius. No matter what gives you anxiety about sending emails, there are a few things you can do to alleviate the fear. You can think of these tips as removing the legs of your bed; it might not remove the fear completely, but you’ll never think about the monster under your bed ever again. They will help providing the peace of mind needed to relax and send with confidence every time. Schedule in advance. Don’t create your campaign 10 minutes before launching time. This is the kind of practice that causes way too much stress. Instead, take advantage of the our Scheduled campaign feature. Create your campaign the day before or even earlier. This way, when the time comes to launch your campaign, you know you’ve done everything you could. Understand the reason for each email you send. When you’re crafting an email campaign-whether it’s a one-off message or customer journey ask yourself why you are sending the email. What do you want subscribers to do when they receive it? Do you want them to read the message, click-through to your website, or purchase a product? Understanding the “why” will help alleviate the fear of sending the wrong campaign. Create a checklist. It’s easy to mess up if you don’t have a checklist, and that’s truer than ever when it comes to email. Create a checklist to run through before you hit send. The checklist should include things like “check the links,” “add a subject line,” “send to colleagues for proofreading,” or anything else that needs to be checked. You could also check out our checklist. Get a proofreader. Typos and grammatical errors can make even the best looking email seem unprofessional, so many marketers live in fear of them. However, it’s very difficult to catch your own typos. Make sure emails have been proofread by at least one other person before scheduling. Remember that mistakes happen. If you mess up some element of an email, it’s not the end of the world. Mistakes happen, and your audience will forgive you. If you make a larger mistake, it can always be addressed with a follow-up email. How to break your fear of broken links: Send yourself as many tests as you want and try every link featured in your email, even the unsubscribe link. Typos are simple mistakes. They usually don’t mess up your overall message, but they do undermine your professionalism though. Typos make it seem as though you didn’t proofread. As a marketer, you want to avoid typos at all costs, but your own typos are very difficult to catch. It’s been scientifically proven that we have difficulty seeing our own mistakes, making the process of finding and fixing typos all the more frustrating. How to break your fear of typos: Send yourself a test and read it out loud. Go slow, and focus on every word. One common technique is to read the message from the end to the start in reverse order, because this can help you catch typos. Some folks even like to print the email out if that helps. Because your own typos are so difficult to catch, you should also send all emails to multiple proofreaders before sending. When you create an email, you make a lot of decisions about design. You use compelling imagery, pick out fonts and colors, and make sure the email is on brand. All of these elements contribute to the overall look and feel of your message, so you want to make sure everything renders correctly. Thankfully, it’s possible to get a good idea of what emails will look like before hitting send. You can send test emails to a number of different email clients to see how everything renders, then troubleshoot from there. How to break your fear of rendering issues: Send test emails to different email clients through your email service provider. Have email addresses meant for tests on all kinds of platforms, open in different browsers, check both mobile, tablets and desktop views, etc. There’s a lot of excitement that happens when we send out emails, especially if it’s a new campaign. Perhaps a new email strategy will result in the highest open rate in the company’s history, a ton of new sales, or heaps of helpful feedback. Even though there is great potential for a new campaign, it’s easy to get caught up in the fear of bad results as you wonder whether your email will do its job. Sometimes, the anxiety around bad results can be so intense that marketers opt to never send any boundary-pushing campaigns at all. How to break your fear of bad results: Give yourself permission to try things out. Understand that email marketing is all about refinement. Not every email needs to be a smash hit, and gaining insight into what doesn’t work is just as helpful as insight into what does. Personalization is extremely powerful. In fact, email campaigns with personalized subject lines are 26% more likely to be opened and marketers have found a 76% increase in email revenue from segmented campaigns. It’s a no-brainer to send someone the right message at the right time with content that’s perfect for them. However, marketers worry that their data is imperfect, and that their personalization efforts will fail because of it. For example, if they want to send an email with dynamic content that shows a different image to men vs. women, they need to ensure their data is correct. How to break your fear of bad data: Update your sign-up forms and ensure your integrations are working correctly. 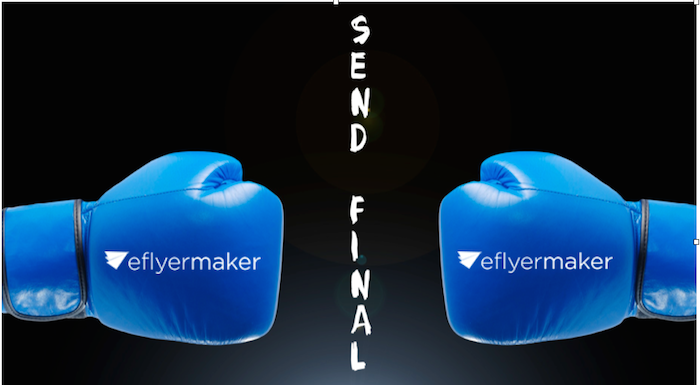 If necessary, use eFlyerMaker’s third party integrations to make sure the right data is passed through. Today’s marketers care deeply about having strong, quality email lists. Your lists matter, and you never want to send the wrong email to the wrong group. After all, that breaks the promise you’ve made to your subscribers– that you’ll always send them relevant information that matters to them. To ensure you send email campaigns to the right lists, make sure your lists are well-labeled so you never confuse them. Additionally, you should make sure that “checking the list” is part of your email sending pre-flight checklist. Lastly, ensure you exclude potential list members you may not want to receive the email. How to break your fear of sending to the wrong list: Make sure your email lists have descriptive names so you don’t confuse them. Each time you send an email, double-check the list you’re sending it too. In eFlyerMaker, when creating a campaign, look at the campaign properties displayed at the top of the page on every step. In the end, it’s natural to feel anxiety before sending out an email, especially if that email will reach hundreds or thousands of subscribers. Don’t let send fear stop you from breaking new ground when it comes to your email marketing. If you use these tips, you’ll be able to alleviate your fears and feel confident each time you hit send.